It’s been a long while between portraits, mainly because it’s a total hoot writing and illustrating books. 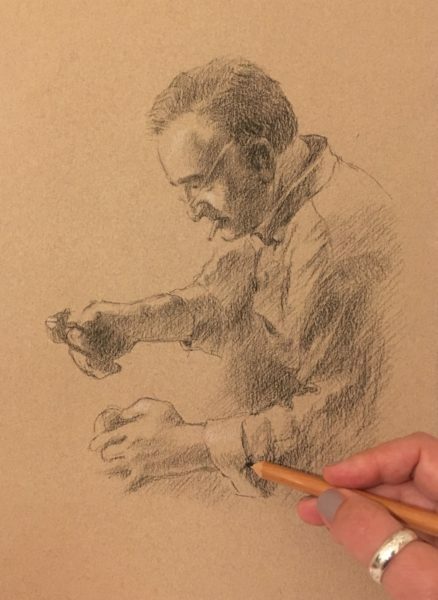 And painting vintage cars, of course But earlier this year I discovered a remarkable young person who inspired me to lift my portraitist’s brush once again. 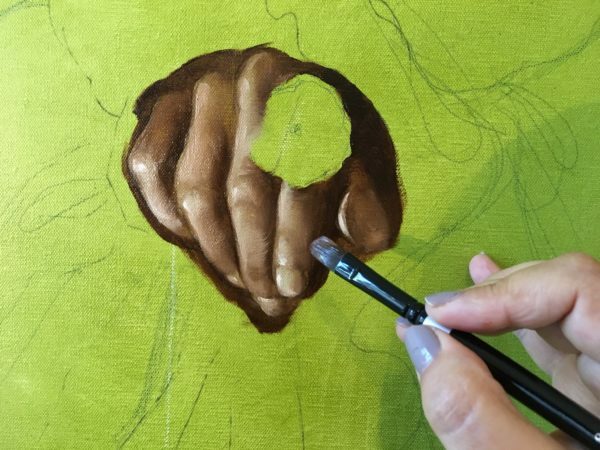 I won’t tell you her name just yet, but here’s a sneak peek of my first brushstrokes and, of course, you can check in to Facebook or Instagram @rosafedele for regular WIP updates. It’s also been a while since I gave you a snippet from Book Two. Look at this character below … seemingly benign, yes? Ha! Read on. “The dreams, no … nightmares, were more frequent now. And then, last night, an old memory, insidious like a cancer, seeped in at the edges of her mind … hundreds of tiny wings fluttering and flying at her face, claws scratching, sharp grey-brown feathers clogging her throat. Strange, she’d never been able to look at sparrows without a faint sickness in her stomach, but she’d long forgotten why. Until now. It had been a game, she thought at first. A game, which entailed lying prone on the ground and waiting for hours, or so it had seemed to a seven-year-old girl. A game, involving a cage built of wood from an old orange crate and leftover wire netting from the chicken coop. It was a game … and a test. A test of patience, a test of silence. Obediently, she had rested her hand, motionless, on the end of the long string attached to the stick which propped up the trap. The ground had begun to cool, for by then the afternoon sun had passed over, and the rough grass prickled and itched against her bare legs. A cramp started to set in her shoulder, but she dared not move. Not during the test of patience and of silence. She could feel her father’s presence as he waited at the window, arms crossed and a wilted yellow cigarette drooping from his lip. ‘Come, pretty sparrow, do this for me,’ she begged silently. The bird paused beside the stick, head on one side, considering. Only a few centimetres, a hands-width, no more. It sprang once again, drawn by the white morsels and in one smooth movement she yanked on the string, dislodging the prop, and the cage came down. The fluttering began, frantic and frenzied, as it threw itself against the sides, battering the wooden walls with its tiny wings, feathers pressing urgently against the wire in its bid for freedom. The twittering was painful to hear, but she sat beside the cage and spoke quietly to the creature, comforting and reassuring words, she thought, until eventually the sun dropped behind the fence and the yard was shrouded in shadow. Her hands reached through the wire and stroked the bird gently, her fingertips learning the smooth feathers, its quivering skin and beating heart. Skittle, she named it, Skittle the Sparrow, and childishly began to plan which ribbon she would place about its neck – a blue one, for she was sure it was a boy sparrow – and it would live in a splendid cage and spoiled with tidbits from the pannettone in the cupboard, and soon learn to perch on her finger. The creature eventually quietened. It didn’t touch the bread, but cowered in the corner of the box, quivering. Her father wandered over. Dragging on his cigarette, he stood and watched them thoughtfully. She imagined he was thinking on how to adapt the little trap into a birdcage, perhaps make a pedestal for the bird from old timber and twist a coathanger into a makeshift swing; he was clever like that – he had a knack for making, for devising, and his hands were deft and capable. He bent over and peeled back a small hatch he had fashioned into the wire and dipped his hand into the cage. Swift and sure, his fingers closed around the creature and lifted it out. She rose up onto her knees and cupped her hands, expectant and keen to receive her tiny, new companion. But, with one movement, he grasped its body and wrenched its head, sharp and sure. She heard the crack, as its little neck broke. She could hardly remember what happened next; there was sure to have been tears, for she was an emotional child, but she could remember what came after – sitting at the kitchen table, green Formica and a loaf of bread, pasta in a bowl and mismatched knives and forks. It was her favourite plate, the one with the dancing maidens around the edge, their full skirts swirling and garlands of flowers threaded between. And upon it the bird was presented, de-feathered and charred. Its head was still intact and its legs drawn close to its body, delicate toes curled up in a ball. When he parted the chest cavity with the sharp knife, she could see the tiny organs; the little heart which, until a few moments ago, had beat so furiously. The flesh, which felt so firm and warm and springy beneath its feathers, was grey and gamey and she chewed dully on the shred that was forced upon her. The sparrow’s blistered eye (her sister’s eye) stared reproachfully, accusingly. The beak was open, a lump of blackened tongue inside. Her sister’s mouth had been open, too … how is your sister, anyway? She had an accident, you say? Slipped and hit her head, and drowned? Did she, now? She woke screaming. A neighbour banged on the adjoining wall. Gagging, she ran to the toilet, actually tasting the flesh, charred and pungent, in her mouth. 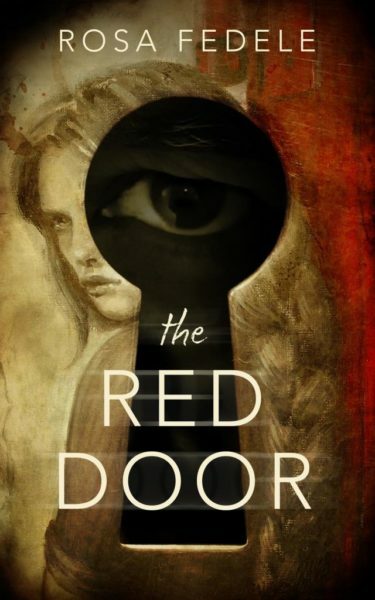 Missed reading the first of the series, The Red Door? Head over to Amazon or iBooks (links below) and grab your copy, and follow me on Instagram @rosafedele as I illustrate book two.